Pulled pork with mango salsa recipe | Everything Delicious. Last week was freezing in Montreal and so on Monday, when temperatures hit -20, I felt like the BBQ pulled pork in my freezer was calling my name. The problem was that the only way I’d ever experienced pulled pork was in a sandwich or burger format, and although I did feel like comfort food, I didn’t want to eat a heavy sandwich either. So after a quick search for inspiration online, I came up with a lighter option, and decided to serve pulled pork with coconut rice & mango salsa. This hit the perfect balance of fresh & comforting I was looking for, definitely a must-try. 2. Prepare the ingredients for the mango salsa: Peel, seed and chop the mango ; wash, seed and chop the red pepper ; chop the scallions. 2. Cook the salsa: In a saucepan, add the mango , red bell pepper, chopped scallions, 1 teaspoon grated ginger, 1/4 cup orange juice, 1/4 tsp. red chile flake. Season with salt and pepper, stir and cook on medium heat for 20-25 min. 3. Cook the coconut rice: In another saucepan, stir the rice, coconut milk and water together. Bring to a boil then reduce heat to let it simmer for about 20 min. When all the liquid is absorbed check if the rice is tender / cooked. If not, add a bit more water and let cook a little wonder. Otherwise, set aside. 4. Prepare the plates: Serve the rice, the pulled pork and the salsa. Garnish with fresh cilantro. 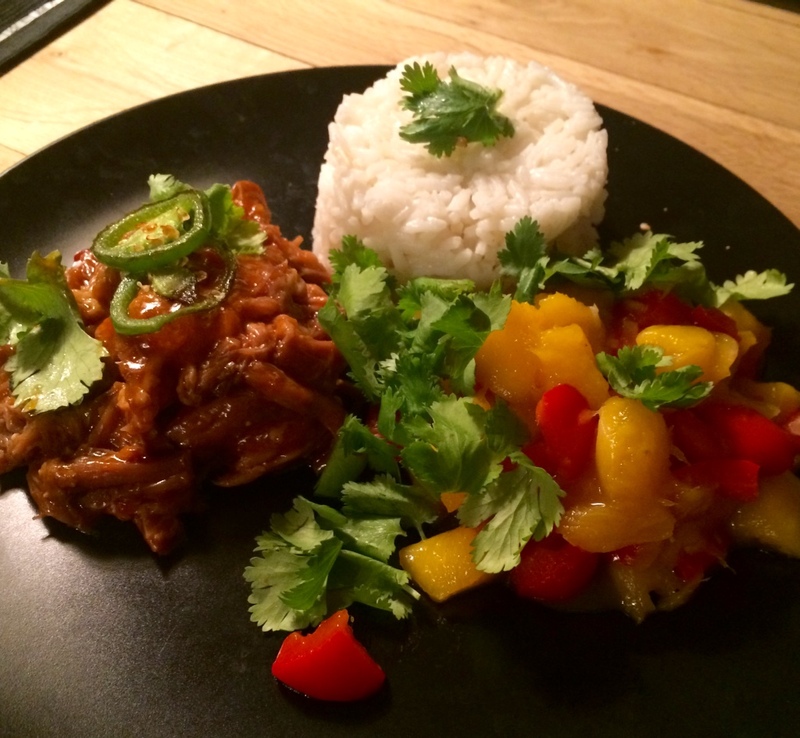 This entry was posted on December 22, 2016 by Pauline Rosen in Recipe feed and tagged carribean recipe, coconut rice, mango salsa, pulled pork, pulled pork recipe.